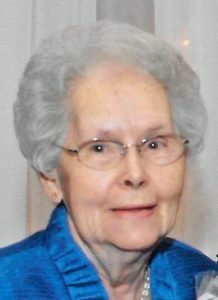 Marjorie Grace (Stayton) Coleman was born August 3, 1927 in Blue Springs, Missouri and departed this life on August 13, 2018 at Foxwood Springs Living Center in Raymore, Missouri at the age of 91 years and 10 days. She was the daughter of Hugh C. and Gladys Marie (Hugill) Stayton. Marjorie lived in Blue Springs until 1937 when her family moved to the Pleasant Hill area to make their home. Marjorie graduated from Pleasant Hill High School in 1945. After graduation she moved to Kansas City for two years and worked for the Kansas City V.F.W. On April 6, 1947, Marjorie was united in marriage with Harley Coleman in Kansas City, Missouri. After their marriage, they made their home in Peculiar, Missouri. Marjorie was very involved in the endeavors of her children. She became a 4-H leader for the Raymore 4-H Club and was a member of the Extension Homemaker Club of Cass County. Marjorie served on both the Cass County Extension Council and the 4-H Council. She was also a well know chaperone for Pleasant Hill’s “Teen Town” for several years. Marjorie was a long time member of the Coleman Baptist Church. She also had served as secretary for P.W.S.D #6 for many years. She was preceded in death by her husband, Harley Coleman; her parents, Hugh and Gladys Stayton; one brother, Ernest Stayton and one sister, Edna Riggs. Marjorie is survived by two sons, Glenn Edward Coleman and wife Katie of Peculiar, Missouri, and Hughie Byron Coleman and wife Marilyn of Blue Springs, Missouri; two daughters, Marjorie Lee Poznick and husband Carl of Olathe, Kansas, and Nancy Coleman of Richmond, Missouri; four grandchildren, Scott Kimzey and wife Seana of Lawrence, Kansas, Kristi Coukoulis and husband Jay of Olathe, Kansas, Jeffrey Coleman of Peculiar, Missouri and Sarah Spilman and husband Matt of Kingsville, Missouri; seven great grandchildren, Marina, A.J., Colton, Cami, Evi, Luke and Caiden. I am sorry to hear about your mother’s passing. Looks like she lived a long life, but it is hard to lose your mother. So sorry to hear about your Momma’s passing. Praying for the Lord’s comfort for your family. I like to express my deepest sympathy for your loss. It was never God’s intent that death should rule over mankind. – Romans 5:12; 1Corinthians 15:26, 55; He will do away with it and He has provided hope-as stated at John 5:28, 29. During this most painful time please find comfort from the scriptures. My condolences to you Hughie and the family in the loss of your Mother. Nancy sorry to hear about the loss of your Mom. My thoughts and prayers are with you and your family. Nancy, Glenn and Family of Marjorie……I am so very sorry to hear of Margie’s passing. She was a sweet lady with a wonderful smile and I always enjoyed visiting with her. May your memories of her bring you peace and serenity during this difficult time. Following is a very nice thought that I would like to pass on to you all..
“Death leaves a heartache that no one can heal and Love leaves a memory that no one can steal”. My deepest sympathy to you all. God Bless. Coleman family, I’m sorry to hear about the passing of your mother. I will always remember her grace, her gentle laughter, and how she always made everyone feel at home. Being a part of the Raymore 4-H club was a special part of my childhood and you four and your parents are a huge part of that. Prayers and blessings for all of you.